Although the Canon EOS R has received some criticism since its initial announcement, especially from the “Pro” users, Japan’s not listening. They’re going to buy it anyway. And they’re going go buy it to the tune of 22% full-frame mirrorless market share in only a month. This instant boom in sales, combined with the Nikon Z7 release has seen Sony’s market share drop from 99.5% in July down to 67% as of October. BCN Retail has released their latest full-frame mirrorless sales report, including a breakdown of full-frame mirrorless sales between April and October 2018. Dear Automated Sales Bots – F*#K Off and Leave Me Alone! Sales 101 says that it is much more profitable to convert sales from existing customers than to retain new customers – but retailers have taken this to a fantastically annoying new level – to the point where I have to waste significant amounts of time and effort to ignore them. Continue reading for a few examples of the most annoying practices of modern retailers and a few strategies that you can use to avoid them. Some drone manufacturers didn’t have a great holiday season last year. But that hasn’t stopped people from buying them. According to a new report from market research company NPD, “premium” drone dollar sales are up. And up in a big way. They’ve more than doubled on the previous year, rising by 117%. NPD define “premium” as drones costing more than $300. The study covers the 12 month period ending in February 2017. And goes on to say that in the first two months of 2017, $300+ drones account for 84% of dollar sales, and 40% of unit sales. Out of that 84%, the majority of them were $1,000+ drones, like the DJI Mavic Pro and Phantom 4. Nikon have released the financial results for the Image Products Business for the first quarter of the year. The report mentions that sales have dropped 8.9%, although net income has increased 176.2% over the same period last year. Another report by Credence Research suggests that this may be the beginning of a trend. 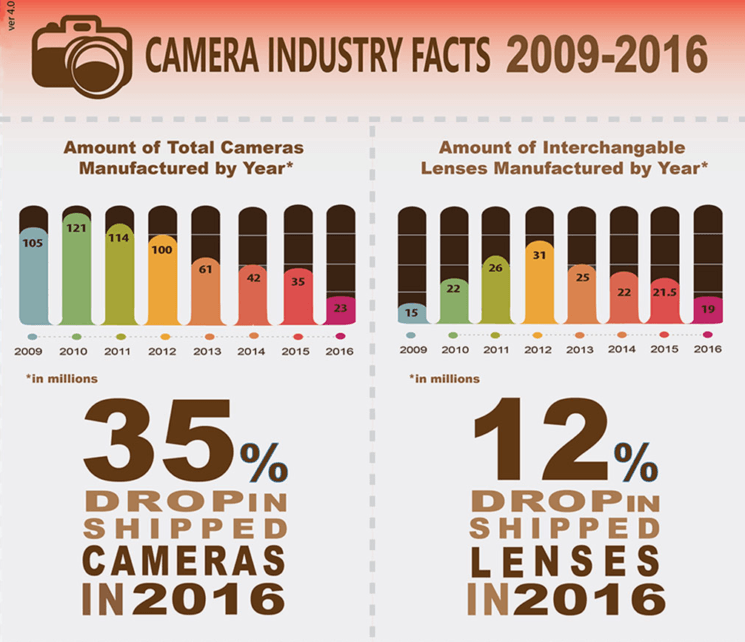 They cite smartphones and tablets as the biggest threat to both fixed lens and interchangeable lens cameras. The general public has no real way of accurately knowing how camera sales compare with each other and while the feeling was that Sony’s mirrorless cameras are becoming extremely popular in certain regions, there is now confirmation that this is in fact correct. According to Michael Schielhlen, a Senior Director at Zeiss, Sony sold more interchangeable lens cameras during the month of August than Canon and Nikon in Germany.